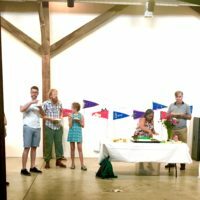 On Thursday, June 21, 2018, ATHICA held a Farewell-To-Tracy Street Reception in which our founders and hosts Lizzie Zucker Saltz and Five Art (currently Valerie Aldridge, Linda Henneman, and Mitch Rothstein) were celebrated for all of their contributions. Emeritus Director Lizzie, long-standing board member John English, and founding landlord Valerie Aldridge all spoke about the history and small miracle of survival and accomplishment that ATHICA has sustained for over 16 years. A slideshow of images demonstrated all of the art and community that have been at the heart of ATHICA. Seventeen years ago, almost to the day, I sat in the blazing sun staffing my own little ATHfest booth; with a fishbowl, a flyer and a stack of volunteer slips destined for said fishbowl. The flyer read: Athens Institute for Contemporary Art: An Idea Whose Time Has Come above a giant Helvetica question mark. Below that was a list of locals with the heading Endorsed by these Fine Individuals. 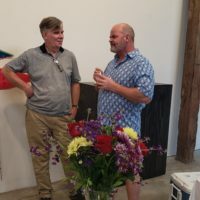 Among those listed were Richard Fausset, then editor of Flagpole, now Atlanta correspondent for the NY Times and the late Donald Keyes, then Contemporary Art Curator at the Georgia Museum of Art. Both contributed to the founding of ATHICA in their way. Three years prior, I had moved to Athens when my spouse landed a job as a Prof in the UGA Theater Department. We had been bouncing around: from the New York Metro area where we both got our undergrad degrees in the mid 80’s, to the Bay Area of California where we completed our graduate studies in the mid 90’s, to outside Richmond, VA where my spouse held his first teaching gig. Along the way, we visited cities like LA, Chicago and Boston. And what all these places had in common was that they all boasted one or more ICA’s, institutes for contemporary art. Those were the places I cherished stopping in at, even more than the major museums, as theirs were the spaces I found myself awakened and challenged in, where I felt encouraged to consider art’s ontology and purpose. What a pleasure it was to encounter artists’ who strove to influence audiences’ politics, perceptions and philosophies; and who––best of all––had fun doing so through tried and new methods and materials. ICAs felt like home, spiritually and intellectually. After exhibiting my own art nationally for over a decade and after writing art criticism for Flagpole and Art Papers for almost as long, it became clear to me that although there was lots happening in Athens in the realm of visual art—not just in music, as was the perception—the spaces for locals to show or see new art outside of the confines of the university or the museum, were far and few between. Yes, there were the cafés and restaurants, the sporadic pop-ups at the Quality Warehouse, and the huge parties at Robert Lowery’s sprawling magical openings. But it was not enough. The Lyndon House had opened just a few years before, and while I enjoyed my curatorial stints there, I had been cramped by the heavy censorial hand of the state. (Fortunately, that is no longer the case at that fine institution). In discussions with Richard Fausset I came to the conclusion that Athens did deserve the kind of censorship-free contemporary art experiences that bigger cities enjoyed; thoughtful curated exhibits of artists from far and near. Under my hat and umbrella that summer of 2001, chatting up the Athfest crowd, gathering the names of talented individuals—many of whom would form our first Board and slate of volunteers—I pondered where such a space could happen, and how it would find financial support. The answer lay with Donald Keyes. Quite a likable fellow, he was full of bubbling enthusiasms, possessed a vast knowledge of art history and had a passionate intolerance of BS. 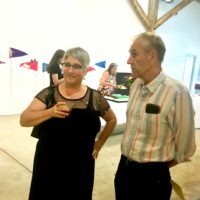 We forged a friendship when he curated my spouse and me into a GMOA exhibit the summer of 2000, called Collaborating Couples. We quickly realized that our views on contemporary art were utterly compatible. At some point he happened to mention that he had been looking to invest in art and photography studios with his spouse, her son and another couple who had collectively dubbed themselves FiveArt. They wanted to create a place where the Athens’ art scene could percolate, far from the noise pollution and squalor of music practice spaces, with sinks and air conditioning for all! Serendipitously, my vision of an Athens’ ICA and FiveArt’s vision of arts-friendly studio spaces fit together like hand and glove. We looked at quite a few places, but it was this space that struck a chord––then only a skeletal shell atop a dirt floor festooned with rubble and fallen beams. The natural light was wonderful and the access for sculpture and installation work allowed by the garage door was ideal for an ICA. 160 Tracy Street was close to downtown, and although no one else at the time but Susan Murphy, the founder of Canopy, would be homesteading it with us, it was obvious that with renovation work and when the wonderful plantings by Valerie Aldridge––Donald’s spouse and an arts advocate––took root, it would clean up well. And indeed, what a booming business community the Chase Park Warehouses harbor now! FiveArt is to be commended for their foresight and faith! After consulting on crucial construction aspects like plywood backed drywall for the gallery and track lighting, filing our incorporation papers with the state, starting the 501c (3) process and such basics, we were ready to open our first show, Raw Womyn, in March 2002, 8 months after my Athfest stint. It was not without last minute drama! Why, the day before the publicized opening, whether the city inspector would approve the door frames was an open question, fraught with uncertainty! With ATHICA’s second show, Artists Respond to War, we received a barrage of entries from artists across the nation, and even two from France and Turkey! Unknown artists and established artists flocked to show substantive work that expressed their passions. Since then, well over a thousand artists and hundreds of performance events have enlivened ATHICA’s space for at least 14,000 visitors, not to mention the armies of curatorial talent shaping concepts into inspiring experiences! And while the funds were mighty tight from the get-go, the love shown us by the community often counterbalanced that stress; from caterers’ donations, AV companies’ equipment loans, Flagpole’s free ads and articles, all boosted our viability. 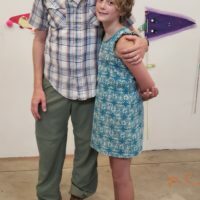 But sustaining it all was the vast generosity of FiveArt; they granted ATHICA three precious rent-free years for us to take wing, and thereafter rent started at $50 a year and went up by as much each year, as we gradually grew more stable. Without that underwriting ATHICA would simply have never been possible. It also wouldn’t have gotten off the ground without the efforts of our first board: Dennis Harper, VP, Kate Tremel, Secretary, Liz DeMarco, Treasurer, Jennifer Maldonado, Technology Officer, and members Rick Herzog and Sally Walker. They were soon joined by artist, critic and educator John English, who has served ably since, longer than any Board member in history! Almost as long was the service of Treasurer Elliot Gootman. I could go on naming names, but I will hold off other than to note that a large number of current GMOA staff members are former ATHICA Board Members or loyal volunteers! ATHICA is forever indebted to the support of the original FiveArt members: Donald Keyes, Valerie Aldridge, Ellen Climo, Marc Lipson and Trent Aldridge as well as the later additions of Linda Henneman and Mitch Rothstein when Ellen & Mark moved. All of them believed in the fundamental validity of my idealistic vision of an ICA for Athens; please join me in applauding them for backing ATHICA and for making real personal sacrifices so that Athens could have its helping of contemporary culture. Through ups and downs, ATHICA has survived and thrived in this beautiful space; a space which reverberates with the ghosts of exhibitions past. But circumstances change, and people come and go. And while ATHICA will no longer inhabit this particular space, please remember it was a dream first and foremost, a dream in search of a space in which to express that dream. I am delighted and excited to see that dream continue under the stellar leadership of Lauren Fancher and the current ATHICA Board, in a new space in the Leathers Building. I hope you will all join us in August for the premiere opening of ATHICA’s next chapter. Lizzie’s account of how Athens wound up with a viable, independent, non-profit contemporary art gallery is powerful testimony for complementary collaboration. Donald was frustrated with his limitations at the campus art museum with its state constraints and short-sightedness. Lizzie had youthful energy, moxie and experience in the cultural avant garde bastions of New York City and the San Francisco bay area. They shared a common mission and both were hard workers. 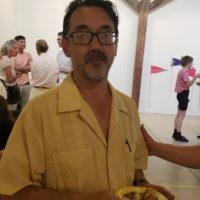 Donald was a community builder and an activist in the Athens arts scene. He was a curator with experience at several museums, was an avid collector of fine art photography, he organized art tours to other cities, he supported the arts council and its artist-designed bus shelters project. He was an engaging lecturer and a rare combination of intellectual aesthete who could wield a hammer or rotary saw. Lizzie was a risk-taker with a conscience. Right from the outset she wanted to show art with social relevance. Lizzie invited artists from all over to explore current topics such as poverty, the energy crisis, war, conservation and recycling, homelessness, the freedom of the press, gender struggles. She sought out artists who were aesthetically diverse and who offered trenchant commentary on political, social and economic issues. She wanted ATHICA to be a place where visitors were surprised, entertained and stretched intellectually and artistically. Right from the outset, both Donald and Lizzie did not want ATHICA to be provincial, so they sought a mix of local artists and others from elsewhere. Intentionally there was a constant mix of art forms—sculptures, very large works, installations, spoken word and poetry readings, experimental music, performance art events. Exciting cross genre pollination! Education was also part of community building, so there were panel discussions of artists talking about their work and experts talking about exhibition topics. Children’s activities were also a regular part of the mix. Both the high quality of the exhibitions and the energy from all the activities created strong local buzz, a regional reputation and national attention. That reputation enticed artists from all over to submit proposals when calls for submissions for a new show went out. It also earned ATHICA a three-year curatorial grant from the Andy Warhol Foundation. ATHICA built community support. The press coverage, both local and regional, was positive. Businesses became benefactors, patrons contributed funds, volunteers showed up to help, members signed up, artists generously donated art works for fundraisers, local caterers donated food for openings and closings, a series of volunteer photographers documented it all. Lizzie had a phalanx of interns, including court-ordered community service workers and she proved to be a capable delegator and patient teacher. 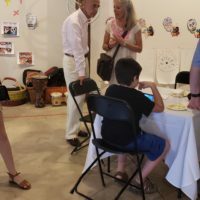 One great benefit of being in Athens is serving UGA students and ATHICA has done that well, inviting students to show their art work, to curate the summer Emerge shows and welcoming them to all our activities. I would like to tell you that ATHICA had a model business plan, but it has always been an ad-hoc operation that worked. In the early years, Lizzie worked for no pay. Eventually the board was able to offer a part-time salary. 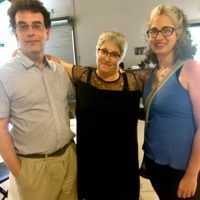 After a decade, Lizzie decided it was time to move on and for a couple of years the board tried supporting a part-time artistic director and gallery manager, namely Hope Hilton and Tatiana Veneruso, but the job was demanding and the board was challenged to raise even a part-time salary. As you might expect, there was some drama. For the past half dozen years ATHICA has been run entirely by its all-volunteer, 13-member board. The leaders who stepped up to serve as presidents were Katherine McQueen, Rebecca Brantley and currently Lauren Fancher. Committee members on the board take on a range of tasks to keep the shows coming. 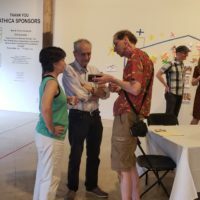 None of it would have been possible, of course, without the steady, long-term patronage of our landlord Five Arts—Valerie Aldridge, Mitch Rothstein and Linda Henneman. More recently the Huffer Foundation has come forward with new support. As Lizzie said, I have been involved with ATHICA for most of the time. I was an admirer and friend of Donald. Lizzie became a mentor when I began creating new works for ATHICA shows. Personally, ATHICA has given me a lot, so I try to give back what I can. There is a generous spirit in this arts community that makes life richer for everyone. I sure have felt it and trust it will keep going and growing.